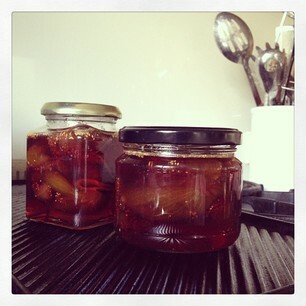 Preserved Figs (and an overdue update). Oh hello everyone, thanks for your patience since my last update! Since I was last on the blog we’ve moved cities and have settled into our very lovely temporary accommodation, just around the corner from mum and dad 🙂 Hubby is very busy learning his new job and I’ve been trying to balance between resting, cooking and nice long walks as we await the arrival of our little baby (which is now just weeks away!). Mum put on a lovely baby shower for me last weekend and we were absolutely spoiled by friends and family, including lots of beautiful sewing and knitting of gorgeous baby clothes and toys. I can confidently say we’re all ready with the bits and pieces we need for baby’s arrival. On a completely different note, I managed to fit in a bit of fun cooking today. My lovely mother-in-law gave us a small box full of delicious looking figs! They were quite ripe and we probably wouldn’t have been able to eat through them all in time before they turned, so I attempted a fig preserve recipe. These will be delicious with blue cheese, meats or even cream cheese on toast if you want to be a little bit naughty! (I’ve shared the recipe below the picture). Wash figs gently in cold water then place in a large bowl, fill with cool water and soak for 20 minutes. Make a syrup by boiling the sugar and water together in a large saucepan. When syrup is clear and just thick, (around 15 minutes) add figs and lemon slices. Bring to a boil over high heat. Boil hard 1 minute then lower the heat and simmer for 30 minutes. Remove from heat and carefully pour into a blender and pulse to grind figs and lemon slices. (I actually didn’t do this as I like seeing the whole figs in the jar. Instead I just broke them up slightly with a metal spoon). You may want to cook down for 10 or 15 more minutes to desired thickness.